I had decided to steer clear of lists for some time now, and focus more on the movies that I have been watching (being on a sick bed is bearable only when you have masala movies to keep you company). However, I remembered that the death anniversary of one of our greatest singers had just passed - on 31 July, 1980, to be precise. Mohammed Rafi (born 24 December 1924) had had a flourishing career that spanned four decades. Indeed, it was a shock when he died, and it is said that never had the city of Bombay seen such a crowd of mourners as gathered for his last journey. The mega-city had come to a standstill, as fans poured out in droves a spontaneous expression of grief. And while one may say that since he died in July, Bombay would have been in the grip of the monsoons, it seemed right in the fitness of things that the rains slashed the city with their fury the day his funeral procession made its way to the cemetery - it was as if the very skies wept at his death. Shammi Kapoor referred to Mohammed Rafi as 'his voice' - and such was the chemistry between actor and his voice that Rafisaab always added something extra to his songs for the former. Such was Rafisaab's ability to change his voice to suit the actor for whom he was singing that you could differentiate the songs that he sung for Johnny Walker, for instance, from the songs that he sang for Dev Anand, from the songs he sang for Shammi Kapoor. Indeed, many a hero from the sixties had to thank Rafisaab for giving their careers a fillip - if it weren't for his voice, where would Rajendra Kumar, Bharat Bhushan, Biswajeet, Joy Mukherjee and their ilk be? It is impossible to choose just a few songs from the repertoire of a singer of whom the Times of India wrote: 'If there were 101 ways of saying "I love you" in a song, Mohammed Rafi knew them all.' And it was not only love songs that were his forte - Rafisaab sang deeply devout bhajans and energetic qawwalis, soulful ghazals and patriotic numbers with equal elan. His voice, combined with his range made him a force to reckon with. This is my very personal list of songs - chosen for no other particular reason than that I liked them. I have tried to keep it to one song per music director, per hero, (and no duets) or I would easily have been able to populate my list with 'Rafi sings for Naushad' or 'Rafi sings for Shammi Kapoor' (that one is coming up later, though I am sure to have the same problem there!) or 'Rafi sings for Dev Anand' and still have had room left for more. So here then, is a very humble tribute to a great artiste and a very good human being. A beautiful Madhubala, a rather good-looking Sajjan, an eccentric but brilliant music director and Mohammed Rafi - enough to make Us paar... worth viewing. Sajjad Hussein's arrogance was unmatched and he gave no quarter where his work was concerned - he composed for less than 20 films in his entire career, having had differences of opinion with practically everyone including his lyricist DN Madhok, Dilip Kumar (during the making of Sangdil), Lata Mangeshkar, Naushad, K Asif, Talat Mahmood and Kishore Kumar. Most of his songs (and background music) were appreciated by his peers. Anil Biswas went on record to say that Sajjad was the only original composer. It was unfortunate that his attitude cost him many films, and we lost the chance to have many more melodies by this talented composer. A Naushad / Shakeel Badayuni gem that has withstood the vagaries of time to make it a genuine classic. Based on the legend of Baiju, who was once regarded as a rival to the famed Tansen, the songs, with the exception of one, were all based on Hindustani Ragas (this one in particular being based on Raag Darbari Kanada). It was a music fest, the score of the film, and it relied heavily on the singing abilities of Rafi, Lata and Shamshad Begum, not to mention Ustad Amir Khan and DV Paluskar. In fact, Ustad Amir Khan was the music consultant for the film. This film also had the sublime bhajan Man tarpat hari darshan ki aaj, and there is a very interesting story behind its recording. Take after take had been discarded because music director Naushad was not satisfied with the song. A patient Rafi had been singing all morning; finally, he told Naushad to get a picture of Lord Krishna. A portrait was quickly bought from the market, and Rafisaab, the portrait in front of him, sang the bhajan so devotedly that he had tears in his eyes throughout. I do not know whether this story is apocryphal, but it is a story that I can believe. In one sense, I think it was a misfortune that Rafisaab could climb such heights of sur. Once music directors figured out that they finally had a male singer who could reach the high octaves so effortlessly, and without going falsetto, it seemed like that is all they would give him to sing! This was also Lata's curse - that she could span the octaves like a bird, that they forgot that she could sing equally well on the low pitches. And if I weren't sticking to 'one song per music composer' then I would definitely have added this one. Even if it were a duet; especially since Rafisaab has sung only a handful of songs for Raj Kapoor, whose soul was truly Mukesh. Or even this one from the 1951 film Jadoo, which Rafisaab mentioned not only as one of the most difficult songs that he had sung, but also as one of his personal favourites. Both songs came from the pen of lyricist Shakeel Badayuni, and from the baton of Naushad. While Rafisaab sang this song for Shammi Kapoor in one of his earliest movies - Shama Parwana - where he starred alongside Suraiya, it wasn't until Tumsa Nahin Dekha in 1957 that the relationship that was unsurpassed made its nascent beginnings - the actor mustered up this courage to go up to the singer, and tell him how he wanted him to sing a particular number. It goes to show Rafisaab's complete lack of ego that he not only listened to Shammi Kapoor, but also rehearsed that number and then recorded it in the way that the actor wanted him to. Why this particular song when there are so many that Shammi has given life to, on screen? Perhaps because this was the beginning, and secondly, I would love to do a post of my favourite Shammi-Rafi songs... so I can include some songs that are not the usual suspects. What can I say about this song that hasn't already been written about before? Burmanda composed a tune that echoed the protagonist's anger, the music building up its tempo until the tempestuous finale - where the poet almost screams out his disillusionment with a materialistic society. And yet, the music does not overpower the voice or the feeling. Fresh from Sahir's pen, it is a scathing denunciation of a hypocritical, materialistic world, one that, in the end, he demands burnt (जला दो, इसे फूँक डालो ये दुनिया), for after all, what use is a world such as this? C Ramachandra was another music director under whose baton Rafi sang some incredible songs, but who under-utilised him woefully. That could have been because a) C Ramachandra himself sang many of his own compositions under the name Chitalkar (Azad and Albela coming to mind) and b) Most of his songs were female solos for which he relied on Lata Mangeshkar. It was also said that he preferred singers who sang in his own style, and thus took on Talat Mahmood and Mahendra Kapoor more than he used Rafi. Nausherwan-e-Adil also had this lovely Rafi-Lata duet... though personally, I think it is wasted on the Raaj Kumar-Mala Sinha pair. A fun frothy film with an equally fun soundtrack - this is part 1 of a double-sided song; the other part rendered by Lata / Meena Kumari as a response to the age-old man-woman duel. And once more, I rue the fact that Meena Kumari was so tightly slotted in the tradedienne roles. Hemant Kumar had begun his career in Hindi films with Anand Math, and achieved moderate success as a music director; around the same time, he also began to sing, most notably for Dev Anand (Jaal, Solva Saal, Baat Ek Raat Ki) under the baton of SD Burman. This is one of those songs which make you wish that the Salil Choudhary - Mohammed Rafi combination had been more prolific. Unfortunately, Salilda did not share that opinion, I assume, since he is one of the few music composers who did not utilise Mohammed Rafi as much as he could have... despite that, he did bring in Rafi to sing Toote hue khwabon ne, since, with all due respect to Mukesh, that is a song he would have found difficult to sing. This film also had Jungal mein, mor naacha kisi ne na dekha hai (picturised on the inimitable Johnny Walker) - and witness the voice modulation... it is difficult to believe that it was the same man singing both songs. One legendary singer singing for another - this was one of the first songs that Rafi sang for Kishore Kumar; he sang about six songs altogether for Kishore. 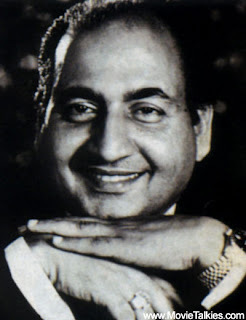 It is said that Kishore, despite numerous rehearsals, could not do justice to the second part of the song, and finally, OP Nayyar asked Rafi to step in to the breach. Despite the feuds between the fans of Rafi and the fans of Kishore, the singers themselves had a great respect for the other. Another film with a social message from the BR Chopra stable, this one was directed by his brother Yash Chopra. Manmohan Krishna lip syncs to Sahir's powerful lyrics which tear at the heart of a society that divides men based on their caste; a human child has no business being anything other than human - caste and creed are man-made divisions that tear at the very fabric of society. Rafi's voice carried the conviction that the lyrics demanded, and holds a bitter truth that our still country needs to hear. While the well-known version of this song was sung by Mukesh, the rendition of this verse by Rafi is impeccable. With very little instrumentation, the rendition depends solely on Rafi's ability to hold the notes true. Another Sardar Malik composition that relied on Rafi was Mujhe tumse mohabath hai from Bachpan. This maudlin love-triangle was remade from its original Tamil - Nenjil oru Alayam - and was later remade in Telugu and Malayalam - which only goes to prove that success cannot be predicted at all. The Hindi version probably succeeded because of its fantastic music. Apart from the above, it boasted of Ruk jaa raat theher jaa re chanda, Dil ek mandir hai, etc. I must confess to a particular bias - though I love Meena Kumari, it hurt to see her ruined by the film makers from the south who insisted on her using large tubs of glycerine, and I am not particularly fond of either Rajendra Kumar or Raaj Kumar - I must have been the only one who watched the movie and hoped the latter would die. A bhajan which almost seemed like blank verse, Roshan used very little instrumentation, preferring to let Rafi's vocals do all that was needed. In a film which resounded with such Lata melodies as the cynical Sansar se bhagi phirte ho, Ae ri jaane na doongi, and Sakhi ri mera man uljhe tan dole, Rafi's mellifluous rendition of Man re... stood out for its stark simplicity. Pradeep Kumar fit the role of army commander to the hilt, while Meena Kumari as Rajnartaki Chitralekha, and Ashok Kumar as Yogi Kumargiri played their roles out in this unending debate about life and love. Co-starring Meena Kumari as Naaz Ara Begum, whose voice Ejaz (Sunil Dutt) hears and falls in love with - Rehman formed the third angle to the triangle in a Muslim social which boasted of a wonderful score by Madan Mohan, who never quite achieved the success he deserved. He once said that "...foremost requirement of a song is only one thing; it should be capable of capturing the interest of the listeners in a short period and sustaining it in the years to follow." And his compositions have withstood his own requirements. This is the film that has the distinction of being the only film in which Helen is the heroine. And it always prompts me to wonder why on earth Chandrashekhar had to be the hero! (He was the producer, duh!) With a soundtrack that included the beautiful Chameli ke mandve tale, and Subah na aayi shaam na aayi this wonderful song was a masterpiece of restraint; Rafi's silken voice caresses the notes and emphasises the sadness that the characters feel. This is one of the films that one must see primarily for its music. And for the beautiful Helen. 1964 brought success to a fledgling music composers Laxmikant-Pyarelal, as Parasmani and Dosti, both films that did not have any well-known names, became box-office hits. Known to be Lata Mangeshkar's proteges, they had a long, close and rewarding association with her. Suffice it to say that she shaped their careers. Dosti also had the lovely Raahi manva dukh ki chinta, and the pathos ridden Jaanewalon zara mudke dekho mujhe and was considered a fluke hit because it did not have a heroine. The film focused on the friendship between two handicapped youth, and had enough pathos to wring tears out of stone. Five of its six songs were sung by Rafi. This is a song that uses the same chord progression as Tum apna ranjh-o-gham from Shagoon, and was widely regarded as the best of Khayyam's compositions. It is an extremely complicated composition and one that is very tough to sing. It is also considered one of Rafi's best numbers. Sixteen music directors, sixteen different songs sung for sixteen different actors - and I have barely touched the treasure trove of songs that Mohammed Rafi made his own. After a lean period where he wasn't recording as many songs as was his wont, he made a comeback with a song from Hawas in the mid-seventies. Usha Khanna wielded the baton for this Neetu Singh-Anil Dhawan starrer. This was followed by a National Award, and a slew of other movies where his songs became superhits. Alas, he did not live to relish his renewed success. Six years after his 'comeback', one of the greatest singers of all time died in his prime - he was only 55. Indeed, suhaani raat dhal chuki. Wah, Anu! Thank you - that was such a wonderful showcase of Rafi's songs. There were a couple here (the ones from Cha Cha Cha and Saiyaan) that I hadn't heard before, and a couple I don't much like - but that latter has more to do with the music than with Rafi's voice. His voice is always, for me, utterly flawless. I have been going through your list and listening to them most of this morning. Am coming to the end of the lot now, and am planning to now begin listening to my own collection of Rafi's songs. Can't get enough of him! Though I guess that should probably go into a separate 'Rafi sings for Shammi Kapoor' post! Kabhi Khud pe.... is such a beautiful song. Dev Anand did have a ear for good music. You know, I struggled to find a song that Rafi sang for Dev Anand because I really do think that he was a better 'voice' for Dev than was Kishore. But because I used Yeh mehlon yeh takhton from Pyaasa, Burmanda got knocked out of the reckoning (I had decided to use only one song per composer) and then Toote hue khwabon ne became the Salilda choice (he used Rafi so rarely) and therefore Maya (and its beautiful songs) were out too. Yes, I noticed Yeh mahalon yeh takhton yeh taajon ki duniya, but that's SD Burman, no? And Teesri Manzil is RD. So I am sticking to your 'one song per composer' rule too! You're so right about Rafi being Shammi's soul - they're a perfect fit. :-) Even though I have heard Manna Dey, Hemant, and Mukesh sing for Shammi, nobody quite manages to BE Shammi as well as Rafi. Yes, but Teesri Manzil is Shammi, and I had already used the Shammi / Rafi combination for the Husnlal-Bhagatram composition from Shama Parwana. Just for you, Madhu. Aap kahe aur hum na mane? :) I hope you like it. Ah, wonderful! What a voice, what range, what emotion... what an artiste! Thank you so much, Anuradha. You have excellent taste in music (and I am not saying that just because I like Rafi) and you write so beautifully. This blog is now one of my favourites. I just can't wait to see what you will post next. Nausharwan-e-Adil(1957)Yeh hasrat thi ki is duniya meinMusic: C Ramachandra / Parvez ShamsiPicturised on: Sohrab ModiPlease correct.Otherwise an excellent piece. Shyam, thanks for dropping by. I did not understand your comment. I have mentioned that Yeh hasrat thi ki is duniya mein is from Nausharwan-e-Adil and is picturised on Sohrab Modi. Music director is C Ramachandra and lyricist is Parvez Shamsi. Can you tell me what is incorrect there? Thank you. If you watch the video you notice it is picturised on Rajkumar. Aargh, aargh, aargh! How could I have missed that?! Thank you so much! "I must have been the only one who watched the movie and hoped the latter would die." But WTF at the ending! Sangam, uh, I guess his death was justified there (And an awesome intense love triangle, ooh! ), but HERE?! WHAT. THE. (BLEEP). At least tell me Rajendra kind of romanced Meena? Flashbacks? Anything to keep me alive? Thank God. -huge sigh of relief- I'll only watch that movie in an emergency though! Really? I kind of think it was the only way to solve the love triangle, but as much as RK's character seems innocent and all, he's kind of the cause of all this trouble. But Rajendra is no less! GEEZ, AT LEAST SAY THAT YOU LOVE HER. And poor Vvjayanthimala. Got stuck in this mess. But Rajendra was suicidal in the first place. When he yells at RK that he loved Radha, and after he's done ranting, he's like, "Now take this pistol and shoot me!" And when RK didn't do that, Rajendra did it himself. Oh gosh. They could've solved the damn love triangle without him dying!! DEK was another pestiforous film, though I loved the songs. What I hate about these heroes bonding with each other is that the heroine is like some parcel they keep passing to each other. She has no free will of any sort. Nobody asks *her* who she wants to live with. Aaargh! AHAHAHAHAHAHA OH MY GOODNESS. XDDDDDD I'M LAUGHING SO HARD MY STOMACH HURTS. AHAHAHAHAHAHA! I liked the ending though. Oh well, I think we agree to disagree. Poor Rajendra too. He sacrifices and then what - his poor knowledge of suicide shows in the end. Oh, I remembered, in my first-ever concert, and it was about the Golden Era (About a year ago, it was plain awesome! ), and they had the song "Ruk Ja Raat". Never knew it was from Dil Ek Mandir. But yeah! Geez, Raaj Kumar, either you die and let Rajendra romance Meena, or you live and romance Meena. Goodness, no need to be like, "Once I die you can marry Rajendra". And Rajendra was probably so irritated with his remarks that he's like, "ARGHHH. IF I END UP WITH MEENA SHE'LL BE SO WEEPY AND... ARGH. I HAVE TO SAVE THIS GUY, EVEN IF I LIKE IT OR NOT." OK, I guess, but even then it SHOULDN'T end with someone dropping dead in the enddddddddddddd! Oh my gosh, how the hell did they get Rajendra to agree to that one. I think at that point heroes vied with each other to be the one to die. :) The sympathy factor, you see. Very late reply, but I just saw this comment. Yeah, someone said that when he walked out of the cinema hall after watching Dil Ek Mandir, the girls were all in tears.